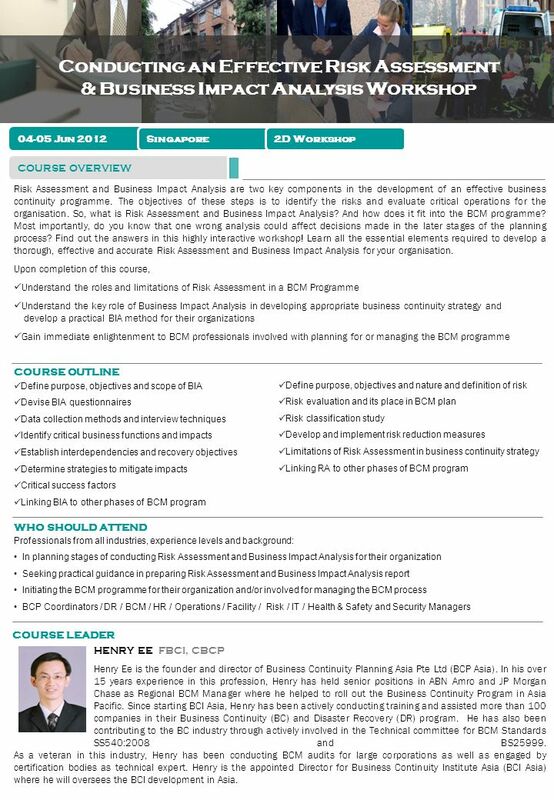 Risk Assessment and Business Impact Analysis are two key components in the development of an effective business continuity programme. The objectives of. Download ppt "Risk Assessment and Business Impact Analysis are two key components in the development of an effective business continuity programme. The objectives of." Intro to Risk Management One Morning Session: Friday, April 22, 2005, 8:30am – 12:30pm SAIC, Science Drive, Orlando, Florida Registration/Sign-In. DG Contract Management Contract Management 1. Contract Management 1.1Contract Obligations & Disbursement Requirements 1.2 Chamber Contract Evaluation. Book on-line by visiting fax to or post to the address below. Chinese Language and Culture, 6 th August Oak Tree. TAA1 Advisor Workshop Learning and Innovation. Program Outline Workshop Introduction Overview of the TAA Scheme Outline of the TAA1 Process Break TAA. REVIEW OF RECOMMENDATIONS OF 2 nd MEETING OF THE NATIONAL COORDINATORS COSCAP – SOUTH ASIA COSCAP – SOUTH ASIA 18 th MEETING OF THE STEERING COMMITTEE. 1 The Data Protection Officer at work Experience, good practices and lessons learnt Pierre Vernhes – former DPO at the Council of the EU Workshop on Data. Welcome to Taxpayer Service Center What is it? – The Taxpayer Service Center (TSC) is an interactive electronic services platform that offers a. CHEMICAL SAFETY TRAINING MAIN REASON WHY YOU SHOULD ATTEND THIS TRAINING 1.To get to know effect of chemicals exposure. 2. To learn how to properly handle. LEVY IMPLEMENTATION 27 JANUARY TO 14 FEBRUARY 2014. NURSING SCHOLARSHIP PROGRAM Program Guidance for New Scholarship Recipients October 5 th & 6 th, 2010 CAPT Sheila K. Norris, R.Ph, MBA U.S. Department. This practical one day seminar provides participants with the opportunity to learn how to successfully establish and run the Bringing Up Great Kids Parenting. Aims: By the end of the seminar participants will: Be familiar and comfortable with the material Be confident in using the material with families in a. Capability Cliff Notes Series PHEP Capability 2—Community Recovery What Is It And How Will We Measure It? TAXATION SERVICESINCORPORATION SERVICESIMMIGRATION & VISAACCOUNTING SERVICESAUDITING SERVICESCORPORATE SECRETARIALPAYROLL SERVICES. 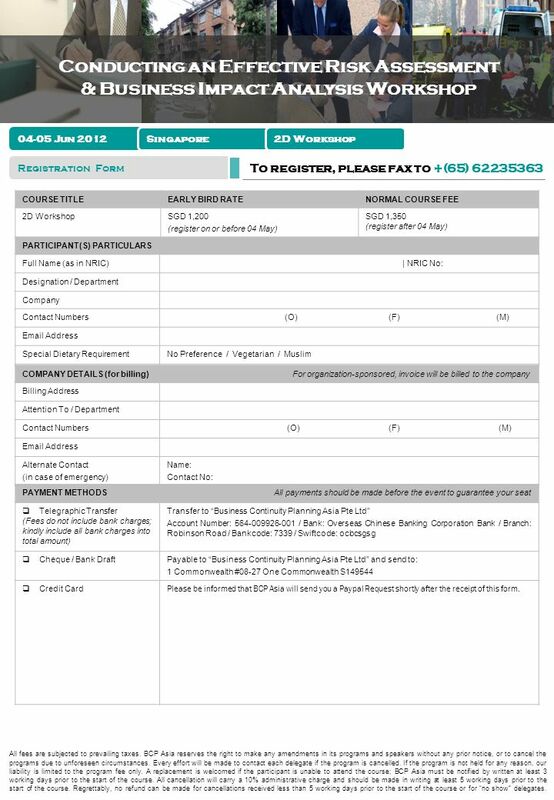 Registration (Particulars of Participants) (SGD) S$2,500 + S$175 (7% Goods & Services Tax, GST) Note: GST is applicable to Singapore based participants.